Mario is back and we know the drill. The Princess has been kidnapped by Bowser. Mario has to travel through foreign lands to try to rescue Princess Peach. What makes this repeated formula exciting is exploring each new world, fighting a variety of enemies, and utilizing a host of unique powers along the way. Super Mario Odyssey is part of the 3D sandbox adventure genre that started with Super Mario 64. This style continued with Super Mario Sunshine and Super Mario Galaxy. Though Odyssey feels more like a sequel to Super Mario Sunshine, than Super Mario 64, which I initially didn't like. Sunshine uses a gimmicky mechanic called F.L.U.D.D. which is strapped to Mario's back. It shoots water out of its nozzle to boost Mario's jumps and combat enemies. It just didn't feel like an authentic Mario platforming game. Odyssey also has a gimmicky mechanic, called Cappy, which is a ghost in the form of a hat. Its mechanic is used to defeat small enemies, collect coins, and possess whatever enemy it flies into. The biggest difference between Odyssey and Sunshine is that Odyssey's gimmick doesn't interfere with Mario's platforming. It's just a useful tool to solve puzzles and fight enemies. 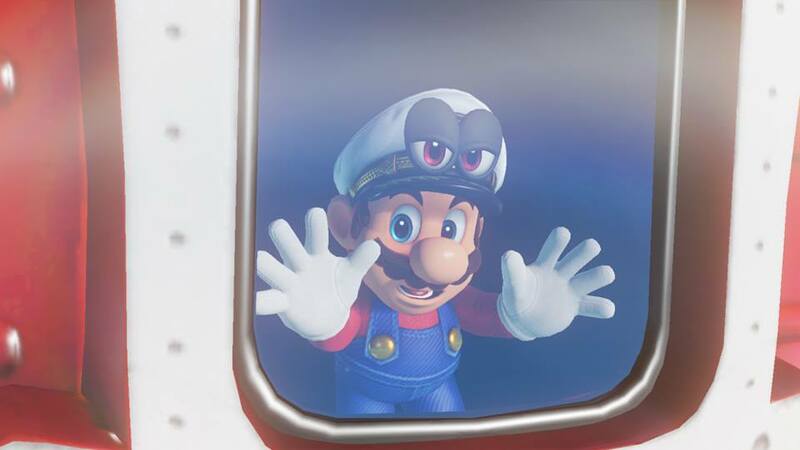 The Odyssey campaign has Mario traveling across the world on a giant hat-shaped airship, that requires Moons to power it, and explore various lands. Moons are collected on each level, similar to prior 3D Mario games. Completing objectives and solving puzzles unlocks a Moon. Each land has several Moons to locate,some of which are also hidden in various nooks and crannies along the way. The lands are fantastic. The variety is almost everything you could want to explore in a quirky Nintendo world. I didn't have a problem with any land I visited, even the lands filled with water. Yes, Nintendo finally managed to make water levels that are fun to explore and that's especially thanks to Cappy's possession of Cheep Cheeps. Each area also has a unique set of friendly NPCs related to the land you're exploring. A big surprise that was revealed right before Odyssey launched, showed Mario hopping through pixelated pipes in the world and exploring a traditional 8-bit Mario universe on the fly. These throw back segments are used to obtain hidden moons and reach out of the way locations. Even though I knew about this before playing, every time I was transformed into 8-bit Mario, I smiled. Though some of the transformation areas are better than others. 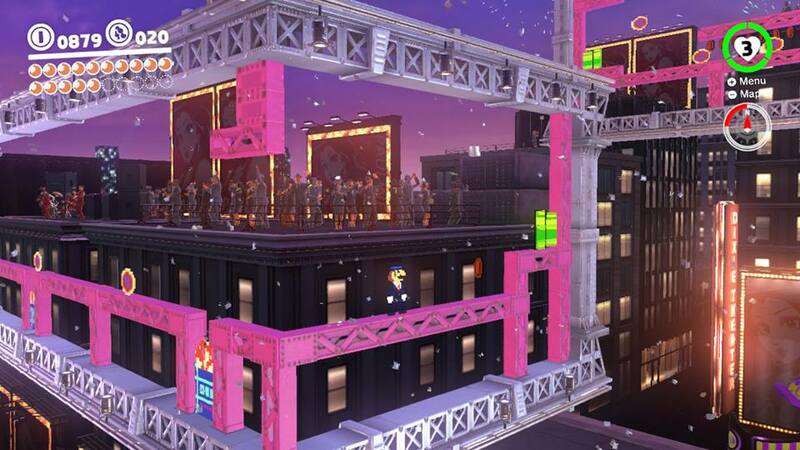 If you want to spoil one of the best moments of the game, just look up the 8-bit transformation in Metro, or New Donk City. It's one of the most amazing experiences I've ever had in a video game. Each land comes with a shop where you can buy various treasures for your airship and costumes. Items are purchased using a specific purple-colored currency found in each land. The costumes are a lot of fun to collect and I often found myself trying to buy them all before proceeding to the next land. They are also themed around the land you are in. For example, the second land is a prehistoric theme so you end up with a caveman costume. Collecting sets allows you to open certain areas for hidden Moons as well. I found myself swapping costumes every time I launched the game and every time I visited a different location. You don't want your Mario running around in swim trunks while in a snowy area. Enemies are a combination of new and old, but mostly new. You'll run into the Hammer Bros. and some Goombas, but I really wanted to see some others return. Maybe transform into Birdo or some Boos. But the new enemies do fit into the Mario universe nicely, and it's great that Nintendo spent time designing new enemies rather than just playing the nostalgia card. The entire game took me about 15 hours to complete, and that's with some mild exploring. The game's length depends on how many Moons you want to collect. The bare minimum would probably cut the games length to around 6 hours for your average player, but what's the fun in speeding through sandbox games? I'm 40 hours into the experience as of writing this with half the Moons in my airship. It's just like any Mario game; you decide how long the game is. Controlling Mario is smooth. There are several control schemes you can use, depending on your play style. But, I never ran into a problem platforming Mario. It feels as good as it always has since Mario became a 3D model. The controls are initially the same as in prior games. Duck and jump causes Mario to backflip for an extra height boost. Running and duck + jump causes Mario to dash and jump for a longer distance. It's the same feel as Super Mario 64 and so-forth. The Switch isn't a beast of a system by any means, but the magic Nintendo works with their games on this system is astonishing. Odyssey looks amazing on my 4K TV. It's vibrant and mostly consistent running 50-60 frames per second. 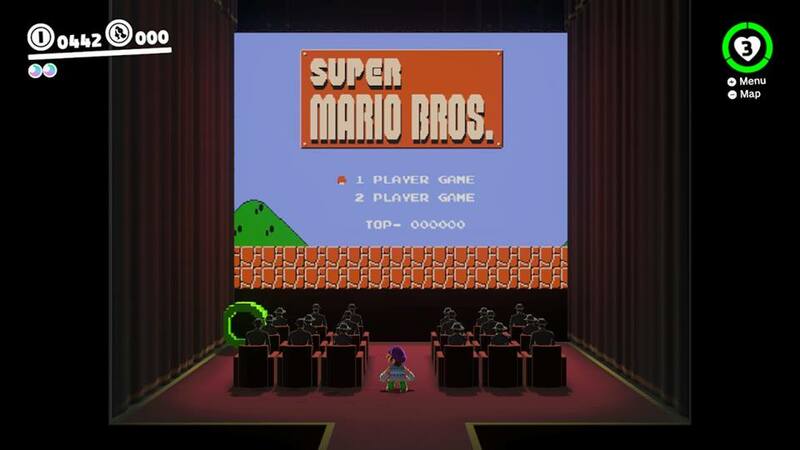 The beautifully rendered worlds are accompanied by one of Mario's best soundtracks. I didn't particularly like some of the background music at first, but over time it grew on me and definitely fit the levels well. Is it the best 3D Mario game? No. It doesn't revolutionize 3D platformers like Super Mario 64 did. 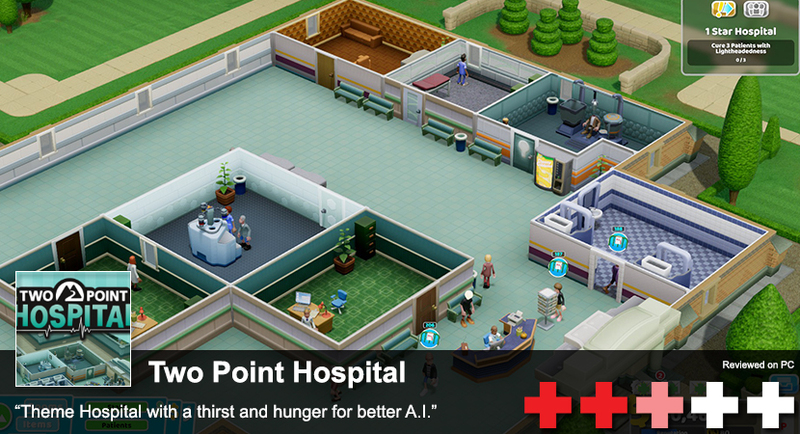 It doesn't feel as innovative as Super Mario Galaxy. But, it's definitely not something to miss if you have a Nintendo Switch. If you don't have a Nintendo Switch, this game is a system seller. 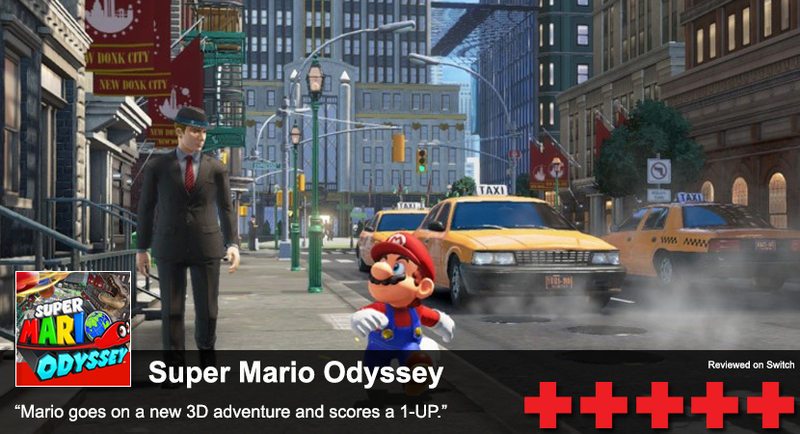 It's worth checking out if you love Super Mario's 3D adventures.